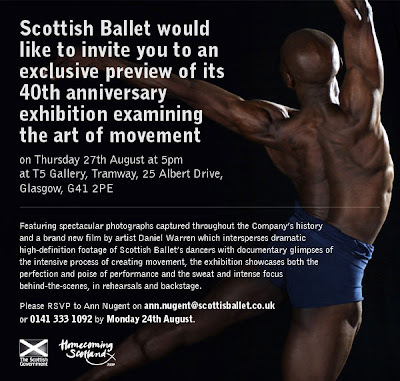 If slowly piruetting perfect human forms are your cup of tea, visit the free 'Scottish Ballet 40 Anniversary Exhibition' at the Tramway, on until 30th September. Girl-e blagged an invite to the press opening, which featured complimentary booze, and a free gawp at the several slender yet muscular people attending. The center of this room-sized collection of still photographs is Daniel Warren's film 'Mercury', filmed at at the current home of Scottish Ballet in West Princes Street, Glasgow. Footage of Paul Tyers' coaching is interspersed with dance sequences shot at 2000 frames per second and replayed at a syrup-slow pace which captures every nuance of the dancers' movements. Apparently the technique is from ballistics filming, although it's strongly reminiscent of nature programmes where jungle cats are filmed running at full speed. Did you know that only the forearm moves when a dancer spins 180 degrees in mid-air? Just now, I tried jumping and landing facing the opposite way. Go ahead and try it - you know you want to. Turns out it's not that tricky in practice, but my version didn't feature the grace or beauty of the real thing, nor does it involve doing the Pointy Swan with my hands. The photographs were selected by artist Colin Lindsay from the Scottish Ballet's archives and show a selection of rehearsals and stage performances. Like the film, all are entirely free of blur and show the performers both holding their poses, in mid air and at gravity-defying angles, including some suitably Aquiline-nosed chap coaxing his partners' legs into exquisite shapes. The exhibition marks the dance company's move to the Tramway for rehearsals, teaching and performances. Free shipping at HQ Hair!